Monday.com, formerly known as DaPulse, has been around the project management block for quite some time. Bagging some major clients including Fiverr, Discovery, McDonald’s and more, Monday has surely made its mark as a great productivity and project management tool, with over 10 years of history. Monday is a project management tool with a multitude of features for team management and project delivery. So, why do we need alternatives? Yes, you read that right. Monday does not believe in Gantt charts. In fact, they have an entire blog on why they pride in offering a tool that does not include Gantt charts. It’s sad but if you’re looking for a Gantt chart software in a project management tool, Monday will be a no-go for you. With so many tools that offer a vast feature set for reasonable prices, Monday seems to lag behind in competitive pricing. The preliminary package costs $25 per month for features other tools offer in less than one-third of the price. Monday does not have an inbuilt module for scheduling recurring tasks. Teams often need to work with certain types of tasks on a daily level. It can be monotonous setting a schedule every day and many tools allow one-time scheduling for such tasks. As with recurring tasks, Monday does not even have its own time tracking feature. You need to make use of third-party integrations to implement it. So, here is a list of top Monday alternatives you can avail today resulting in an equal or even higher level of user satisfaction and team productivity. First up on our list of free Monday alternatives is nTask. A project management and team collaboration tool, nTask caters to teams from numerous industries with varying work patterns. nTask has a clean interface and very intuitive to learn. With efficient modules placed neatly on the side, it helps you work with tasks, projects, meetings, timesheets, risks, and issues with ease while managing multiple workspaces simultaneously. Comprehensive task management that allows you to structure your work through task creation, organization, prioritizing, assigning and sharing. You can schedule tasks on a one-time and recurring basis. You can either create projects and associated tasks or treat tasks independently. Plus, you can switch tasks between projects, which makes it easier to improvise along the way. By integrating with Slack, you can create tasks and projects during discussions with team members as well as send updates from nTask to Slack conversations relevant to tasks and projects. Efficient project management through timelines, percent-complete tracking, Gantt charts, efficient reporting, and resource allocation. Track time for each task individually for better task planning. Through the timesheet management module, employees can list down the hours spent on tasks and shows the cost incurred per resource. You can manage employee task efforts and payroll with this dedicated module. A complete meeting management module for scheduling meetings. You can schedule meetings as one-time or recurring with sending invites to attendees, adding timing and location details as well as adding follow-up tasks and decisions. The issue management feature helps you easily track issues through listing them down with multiple statuses and assigning an issue owner. Identify potential risks through the risk management module. You can list down the risks assigned to a risk owner and with multiple statuses. Send alerts, notifications, and reminders to keep teams on track. Sign up for the best Monday Alternative today, it’s absolutely free! Work with tasks, projects, Gantt charts, meetings and more in nTask. Sign up today. With Hygger, you get a free Monday alternative that offers team and project management, all the while catering to popular Agile frameworks. With Hygger, you can effectively implement Agile practices through Scrum and Kanban boards. You can also combine both the approaches to customize the way you keep track of your team and projects. You can avail a spectrum of features dealing with task and project management, time tracking, issue management, and customer feedback. Task and project management through Scrum and Kanban boards. Through Swimlanes or Labels, you can organize tasks on your boards. Plus, you can identify and tackle potential issues via visible bottlenecks. Time tracking and estimation for tasks through hours, log time it took to complete a task and the hours logged and hours estimated ratio. Project reporting through Gantt charts, percent complete tracking, milestone tracking, Burndown report for Scrum and Cycle Time for Kanban real-time monitoring. Free – Free forever, no strings attached. 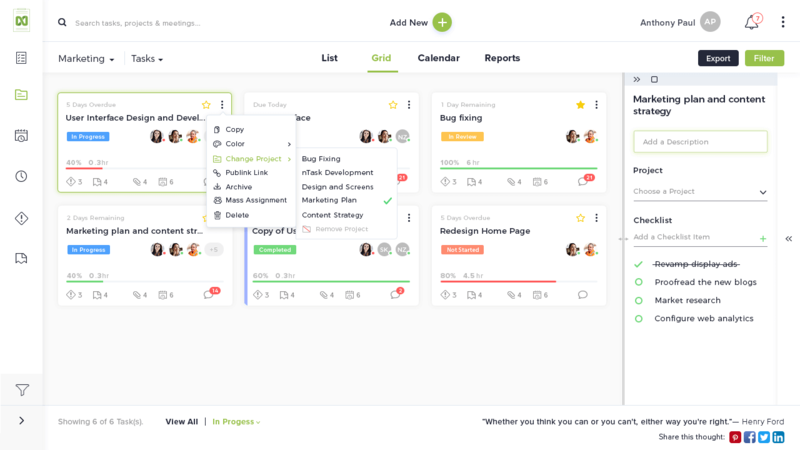 Allthings is a Kanban based tool for project management and team collaboration. This is one of those free Monday alternatives that help you organize and monitor your work via a neat interface using drag and drop. View tasks, status updates, send notifications, share lists and track time for efficient project planning and coordination. Plus, with Hygger, you can add your own custom fields to have more control on the way you steer your projects. Task management including creating, organizing, prioritizing and sharing tasks and to-do lists. You can set deadlines for one-time as well as recurring tasks. Project management options including daily email of work summary and highlighted deadlines to stay on time. Time tracking for tasks and estimation of time spent. Comments and file attachments for added information. Another tool that makes it to our list of free Monday alternatives is Avaza. Avaza covers project management from the very beginning i.e. customer quotations and to the very end, i.e customer invoicing. This project management tool is one of our top suggestions as an alternative to Monday. Just like other basic project and team management software, Avaza also allows you to be more responsive to customers using the Questions tab. You can also share detailed project estimates with potential clients. On approval, these estimates can be converted into a project right away. Our 5th pick for free Monday alternatives is Project Insight. Catering to project and portfolio management, avail numerous features through a centralized interface including task and project management, team communication, resource management, expense estimation and more. Plus, you can customize themes, labels, and fields as required. Task management including customization for fields, forms and other elements. Project management including project dashboard reports, Gantt charts, status updates, project budgeting, reporting and scheduling. FREE – Basic functionality. Free forever. Winning the hearts of giants including Disney, Amazon, and more, TeamGantt is definitely one of the top Monday alternatives. To begin with, you can easily manage and reorder tasks through drag and drop including recurring tasks. Project management is easier with templates, timelines and Gantt charts. Plus, it offers time tracking, project dependencies, filters and more. You can even embed specific project timelines to your website. It helps you work with ease through drag and drop so it is practically effortless. With all this and more at a reasonable price, be sure to check out TeamGantt as one of your Monday alternatives. Aceproject is a neatly designed project management and time tracking app ready to replace Monday anytime. This tool offers all features to take tasks and team collaboration a notch up. It includes multiple modules including projects, tasks, timesheets, document, and expense laced with multiple options. This gives you a start to finish tool managing every aspect of your business. If this wasn’t enough, Aceproject offers five different pricing plans, including a free plan. Plus, it covers most of the features Monday lacks such as Gantt charts, time tracking and more. Want more? check out the key features and be ready to switch today. Expense management including expense tracking, approvals, and advanced reports. Sampage is an all-in-one collaboration tool that gives a refreshing twist to project management and teamwork. We consider Samepage as one of your best Monday alternatives due to its different yet interesting work environment and affordability. You can manage tasks, projects, online meetings, collaboration and more through one entity – pages. Each user can work on different elements on different pages that can be edited together. Through pages, users can work on different parts of work assigned such as images, online meetings, documents, etc. Take a look at the key features to know more about this Monday alternative. Used by more than 3000 teams globally including Microsoft and Disney, Teamweek is a great choice when you’re looking for Monday alternatives. With a feature set that helps you organize and manage work visually; this tool endorses the saying that a picture is worth a thousand words. Offering options ranging from capacity planning to project updates, you get to monitor more in a simple glance than studying complex reports. Organize teams, view roadmaps, downloadable shared timelines and more with this versatile tool. Customize events such as assigned holidays, work plans and set milestones. A great feature is its annual review where you get to see how far you and your team have come across the year. With all of these features and more, you are sure to get the value for investment with Teamweek. This Monday alternative provides a wholesome experience enabling you to manage various aspects of project management under one roof. It is easy to work with; just drag and drop – be it tasks or projects. It offers an enormous set of features for tasks, projects, and team management and collaboration. You can create private or public projects and tasks. It also makes project management and workload balancing particularly easy through project split view. Plus, you get updates on projects and tasks through Slack. With beautiful colors and a short learning curve, Flow helps you create smart workflows and effective roadmaps so you and your team can stay productive. With over 17,000 customers worldwide, this Monday alternative is an easy choice for teams on all levels. Comprised of a broad spectrum of customizable features related to tasks, projects, and collaboration, Wrike makes work easy and result-oriented. Time tracking helps you assess the time spent on tasks, which can, in turn, be used for workload balancing. Plus, it offers multiple payment plans, which makes it more appealing to different types of teams. Check out the key features to know why Wrike can be one of the more powerful Monday alternatives available. Which Monday or DaPulse alternative does your team rely on? Give your suggestions in the comments below.